We’ve rounded up our top picks of the hair havens offering group bookings or private rooms, so you can make this Galentines Day the B-E-S-T for your BFFs! Whether there's a select few of you or a larger group getting ready before a night out in the West End, at Duck & Dry blow dry bars there are endless ways to bring your gal pals together. As well as the option of group bookings to nail that bouncy blow dry, at the Chelsea and Oxford Circus spaces there is also the option to hire out the venue for up to 18 guests - ideal for a big celebration with your whole squad. Enjoy your own private space with dedicated stylists, cocktail bar and party vibes - perfect for socialising and sipping on a prosecco or two! Looking to really treat yourself and your friends? The Private Rooms at the Paul Edmonds salon in Knightsbridge offer one-on-one hair and beauty treatments in sumptuous surroundings. With a contemporary twist on 1940s glamour, it's the ideal place to relax and unwind, or to make use of the Insta-worthy décor! When paying a visit, be sure to head to the Ruinart champagne bar at the salon - you deserve it! Located in the heart of the city centre, the flagship Andrew Collinge salon is modern and spacious, and a great place to treat both your friends and your tresses to some TLC. With a private room available as a little retreat away from the rest of the world, the expert hairstylists are on hand to deliver some amazing treatments - from Olaplex to updos and everything in between, there's never been a better time to have a catch up with close friends! Looking for a stress-free hairdressing experience to relax with your nearest and dearest? 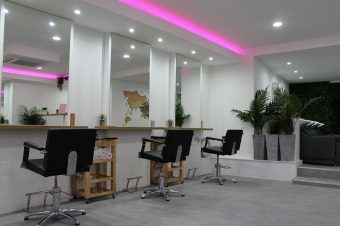 With a natural colour scheme and contemporary interiors, the Russell Eaton salon in Barnsley offers a calm and tranquil atmosphere, ensuring you are completely pampered from start to finish. It doesn't stop there though, as the salon also boasts an upstairs Relaxation Zone, where you can enjoy luxurious aromatherapy hair treatments and colouring services. Planning a serious catch up with your pals? Pay a visit to the exclusive private room, which is available for individual consultations. Situated in the heart of Glasgow's Merchant City, the Maugé Style salon is a great place to visit following a girls' day out shopping, or before getting ready to go for dinner and drinks. Unwind and enjoy the luxury salon space, while receiving personalised advice on how you can achieve a hairstyle that makes you look great and feel fabulous. Want to whip up a styling storm with your closest friends? The salon also offers a private area to ensure you feel totally at ease and ready for a natter! For those looking for a little more privacy for Galentines' festivities, the private room at the Richard Ward salon in Chelsea is available during usual salon opening hours for all cutting, styling and colour needs, as well as manicure or pedicure services. 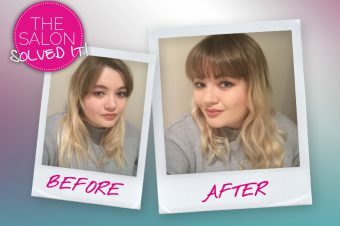 Why not have the best of both worlds and book both a hair and beauty appointment? It only comes round once a year after all! As if that wasn't enough, there is also a relax zone that features cosy sofas and a giant plasma TV, plus a fully licensed bar with fantastic coffee and food on offer too. If you're looking for a salon experience like no other, Crowded House is the place for you. Described as an 'experience centre' where all your favourite indulgences are under one roof, visitors can enjoy all the usual salon treatments and services, before tucking into a delicious meal at the salon's very own restaurant and bar - sounds pretty great, right? Best of all, group bookings are available for everything from blow dries to quick beauty treats, making it an ideal location to enjoy with friends and spend some quality time together! Want to unwind with friends in a relaxing space away from the hustle and bustle of the main salon? The Private Vault at Salon 64 is a deluxe space where hair styling and beauty services are offered. Featuring a luxurious treatment chair, the sleek and modern interiors offer a serene and calming area that's the perfect place for pampering and a chance to unwind with your closest friends. After finishing up your treatments, why not head to the bar area, where you'll find a fantastic menu of drinks and snacks on offer - both the coffee and the cocktails are delicious! Whether you're looking to make a group booking for some fabulous blow dries, or simply want a private room to talk to your heart's content, RMUK has got you covered. With cosy furnishing and gorgeous floral displays, the private room of the salon is a great location for a pamper session, and the salon's bar is available to enjoy drinks and nibbles before and after your treatments. The salon also offers three packages which can be booked for up to five people, and each includes a chauffeur service. We recommend the gold package which includes a one hour Aveda treatment, blow dry and express manicure with hand massage, plus afternoon tea with a glass of prosecco! At Elements Lifestyle, there are a number of packages on offer. From styling sessions for all ages to pamper parties for larger groups, each evening is unique and created especially with the group in mind. For larger groups the pamper evening is ideal, with each guest receiving a mini treatment (shampoo and head massage) followed by a group blow dry lesson. There will also be a talk on seasonal trends, a mini make-up lesson, lifestyle taster treatment and a goody bag to take home. For smaller groups, there is also the option of a two-hour lesson where you can learn to make your hair look amazing. Got a best friend that you're really looking to treat? Top To Toe offer a double treatment room which is available for booking for a whole host of beauty treatments, including massages and facials. For those looking to treat more than one friend, there is also the ground floor room which can be used for both hair and beauty appointments, and works as a private space away from the main salon. There is also the option to arrange a 'pamper package' for you or someone special - the perfect opportunity to get glam and make the most of all the salon services! Wait, now the mullet's back too? ?